Wealthy NBA, NFL, and rap stars get plenty of attention. But, overall, the actual wealth of African Americans barely registers, hidden behind a decadent veil of black celebrity. I don’t care if Odell Beckham Jr. scores another NFL touchdown this year while wearing the rapper Drake’s OVO cleats. I don’t care if Stephen Curry gets along with Kevin Durant this NBA season. And I really don’t care what Lebron James thinks about Hillary Clinton and the election. What I do care about deeply: why we have so little black wealth in America. African Americans today own little if any of America’s land, produce little if any of the country’s resources, and possess negligible amounts of this nation’s immense wealth. Yet African Americans still project an aspiration based on a blind faith in the American Dream. We see the fallout from Chicago to Baltimore, as police march into rioting black communities starved of resources. #BlackLivesMatter. But no leading public figures are talking, in a substantively consistent way, about the state of black life as the economic catastrophe it has become. We’re not hearing anything from President Barack Obama or the Congressional Black Caucus — and definitely not from Hillary Clinton or Donald Trump. Not even black families themselves are dealing with the hard financial realities of our times. The National Association of Real Estate Brokers 2016 report, The State of Housing in Black America, put the current home ownership rate for blacks at a 20-year low of 41.7 percent, a lower home ownership rate than during the Great Depression of the 1930s. In fact, if you deduct the family car and other depreciating assets from net worth, half of all black American households hold less than $1,700 in wealth. The net worth of the median white family remains near $100,000, using the same method of accounting. A recent study by the Institute for Policy Studies and the Corporation For Economic Development notes that it would take 228 years for the average black family to amass the same level of wealth the average white family holds today. This gap will never close if America stays on its current economic path. According to the Institute on Assets and Social Policy, for each dollar of increase in average income that African American households saw between 1984 and 2009 just $0.69 in additional wealth was generated, compared with the same dollar in increased income creating an additional $5.19 in wealth for a similarly situated white household. Earlier this year I had the opportunity to have an in-depth discussion with African American media mogul Byron Allen, an exchange that can be heard on my YouTube channel. Allen is reportedly worth in excess of a billion dollars. He characterizes the current situation facing black families quite simply as “economic genocide” and has brought lawsuits against the telecom giants Charter and Comcast for avoiding doing business with fully black-owned media companies. Why can’t more people get honest about the absence of black wealth in our society? I believe that a decadent veil of black celebrity is masking the massive amount of black poverty. African Americans see Jay Z purchasing Tidal for $56 million and not the millions of black American families that have lost half of their wealth over the last several years. For a generation, African Americans have been confusing celebrity exceptionalism with economic progress. Quotes from wealthy African American celebrities on overcoming the odds fill vision boards on bedroom walls and seem more important than real economic struggles. Meanwhile, a middle white America overexposed to a few million-dollar NBA stars has become apathetic about the actual plight of black Americans. We must remember that the empathy of the white middle class counted among Dr. Martin Luther King Jr.’s greatest tools in his battle for equality and civil rights. Now apathy has set in. The actual numbers give no cause for this apathy. African American celebrities make up a tiny share of the overall population of over 40 million black people. And celebrity entertainers and athletes, Thomas Piketty notes in his acclaimed Capital in the Twenty First Century, “make up less than 5 percent” of America’s richest 0.1 percent. Most of the wealthy come from the ranks of corporate “super managers,” and African Americans make up just 1 percent of S&P 500 CEOs and just 2.6 percent of those holding posts within striking distance of corporate chief executive suites. Just last week Forbes released its annual report on the 400 richest people in the United States. The all-white top 25 on the 2016 Forbes 400 have a combined net worth of over $900 billion, over 37 percent of the total $2.4 trillion in wealth held by all 400. Wealth in America is simply not diverse, and that reality remains true no matter how many times we are shown Lebron James in his mansion in feel-good commercials. For every singular sports phenom, we have countless white wealth holders making money that black Americans are locked out of accessing. Whites, ironically, even make up the bulk of the less than 5 percent of entertainers in the top 0.1 percent of earners. 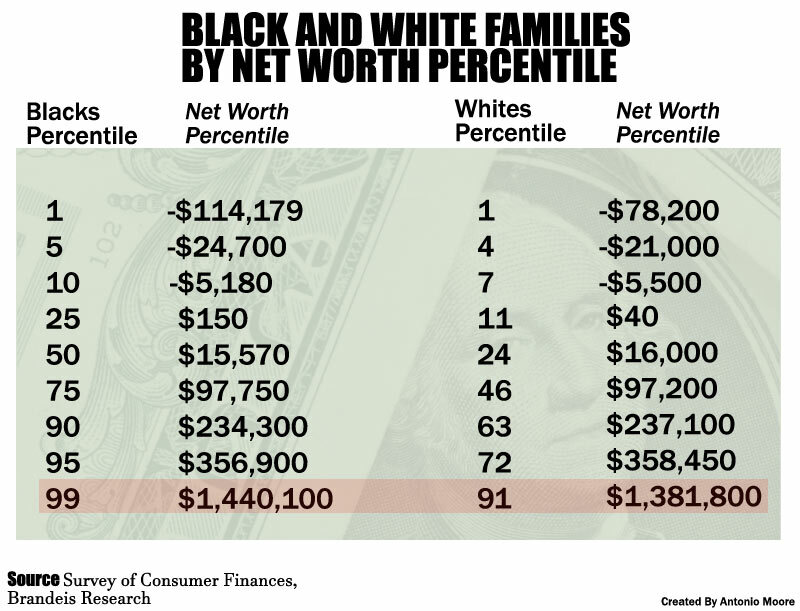 More numbers: Data recently released by the Federal Reserve Survey of Consumer Finances and researchers at Brandeis University show that less than 1 percent of black families have over $1.4 million in net worth. Nearly 10 percent of white families hold the same amount of wealth. In raw numbers, well over 8 million white homes rate as millionaires, while less than a few hundred thousand black families can claim the same million-dollar status. In addition, a mere several thousand black families can claim to be within the top 1 percent of earners. We now live in a time when the five largest white landowners in America own more agricultural land than all of black America, with all white families together owning 98 percent of the land. Our top 10 percent of white households own nearly everything, as the think tank Demos reports, with the next tier of white households holding most of the remaining wealth. In fact, the $2.4 trillion held by the Forbes 400 amounts to more than the combined wealth of all 41 million black Americans. This is the truth about the amount of wealth held by the progeny of American slavery. Blacks live in the wealthiest country the world has ever known. But most African Americans have little if any personal wealth to show for it.